For many years, the Chinese woman complained of nasal congestion and bleeding from the nose, believing that she had chronic rhinitis. 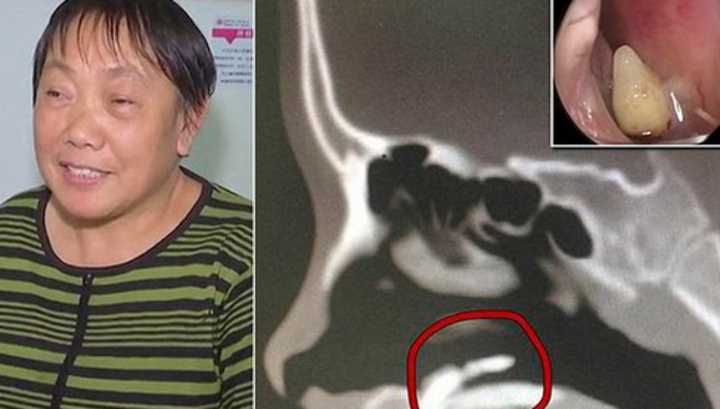 However, when she still decided to take a serious examination, the otolaryngologists from the Hunan Provincial Hospital found she had an alien body in her nose on an x-ray. At first, the doctors decided that a small stone had got there and decided to remove it. However, already during the operation it was found out that a tooth had grown in the nose of the patient. The doctors have successfully removed it, the woman feels well. She stopped bleeding and disappeared nasal congestion. The dentist, commenting on this story, explained that teeth, indeed, can grow not only in the oral cavity, but cases of their appearance in the nose are extremely rare.